Yesterday was a strange day … so odd that I missed posting a space history anniversary. It crossed my mind, briefly, once. I’m deeply disappointed in myself, of course. It just so happens that forty years ago yesterday — August 9, 1973 — the USSR launched Mars 7 on a Proton K rocket from the Baikonur Cosmodrome. reached Mars on 9 March 1974. Due to a problem in the operation of one of the onboard systems (attitude control or retro-rockets) the landing probe separated prematurely (4 hours before encounter) and missed the planet by 1300 km. The early separation was probably due to a computer chip error which resulted in degradation of the systems during the trip to Mars…. The lander and bus continued on into heliocentric orbits. Forty years ago today — August 5, 1973 — the Soviet Union launched their third of four 1973 missions to Mars from the Baikonur Cosmodrome on a Proton K rocket. The Mars 6 “interplanetary station” featured a descent module that separated from the spacecraft bus to enter the Martian atmosphere. The bus continued on a flyby, while transmitting back telemetry. The first pair of the USSR’s 1973 Mars spacecraft had launched in July, and reached Mars in February 1974. Mars 6 arrived at Mars on March 12, 1974. The descent module separated from the bus at a distance of 48,000 km from Mars. The bus continued on into a heliocentric orbit after passing within 1600 km of Mars. The descent module entered the atmosphere at 09:05:53 UT at a speed of 5.6 km/s. The parachute opened at 09:08:32 UT after the module had slowed its speed to 600 m/s by aerobraking. During this time the craft was collecting data and transmitting it directly to the bus for immediate relay to Earth. Contact with the descent module was lost at 09:11:05 UT in “direct proximity to the surface”, probably either when the retrorockets fired or when it hit the surface at an estimated 61 m/s. Mars 6 landed at 23.90 S, 19.42 W in the Margaritifer Sinus region of Mars. 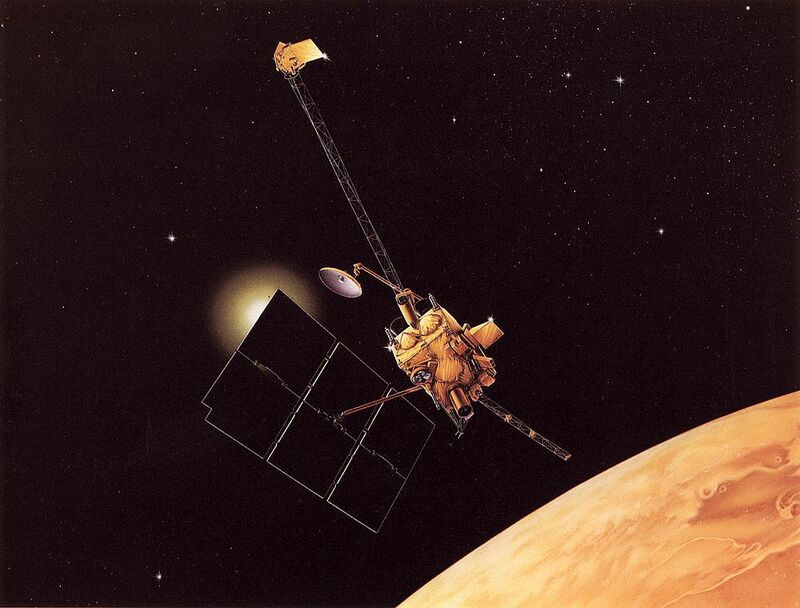 Mars 6 was the first spacecraft to send back data from Mars, though its lifespan was very short as indicated above. It sent back a little under 4 minutes’ worth of data (224 seconds, to be exact). Unfortunately, much of the data were unreadable due to a flaw in a computer chip which led to degradation of the system during its journey to Mars. Forty years ago this week, the Soviet Union was in the midst of launching the first two spacecraft of a four-vehicle mission to the red planet. Each was launched from the Baikonur Cosmodrome on a Proton booster. The first of the spacecraft, Mars 4, was launched on July 21, 1973 — so 40 years ago today, it was on its way. Unfortunately, it was unable to enter orbit when it got to Mars. It was put into Earth orbit by a Proton SL-12/D-1-e booster and launched from its orbital platform roughly an hour and a half later on a Mars trajectory. A mid-course correction burn was made on 30 July 1973. It reached Mars on 10 February 1974. 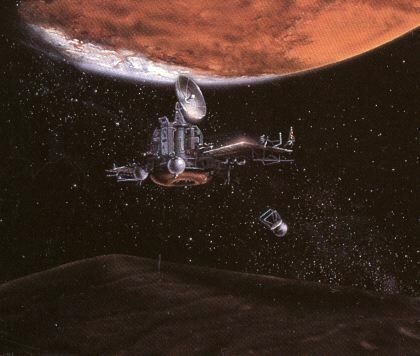 Due to a flaw in the computer chip which resulted in degradation of the chip during the voyage to Mars, the retro-rockets never fired to slow the craft into Mars orbit, and Mars 4 flew by the planet at a range of 2200 km. It returned one swath of pictures and some radio occultation data which constituted the first detection of the nightside ionosphere on Mars. It continued to return interplanetary data from solar orbit after the flyby. The first of its companion spacecraft, Mars 5, was launched on July 25, 1973 — so 40 years ago today it and its Proton booster were undergoing final preparations for launch. Mars 5 successfully achieved Martian orbit, but operated for only a short time. After a mid-course correction burn on 3 August, the spacecraft reached Mars on 12 February 1974 at 15:45 UT and was inserted into an elliptical 1755 km x 32,555 km, 24 hr, 53 min. orbit with an inclination of 35.3 degrees. Mars 5 collected data for 22 orbits until a loss of pressurization in the transmitter housing ended the mission. About 60 images were returned over a nine day period showing swaths of the area south of Valles Marineris, from 5 N, 330 W to 20 S, 130 W. Measurements by other instruments were made near periapsis along 7 adjacent arcs in this same region. Despite their ultimate failures, the series of launches themselves were quite an achievement: preparing and launching two big boosters one right after the other, and then doing it again two weeks later. One of the most interesting experiences of my Air Force career was getting to observe the initial stages — primarily mating the spacecraft to the launch vehicle — of a Proton launch campaign at Baikonur. Having seen what goes into a single launch, that they launched four payloads in such a short time is very impressive. Twenty-five years ago today — July 12, 1988 — the Soviets launched the second of two Mars orbiters atop a Proton K rocket out of the Baikonur Cosmodrome. Phobos 2 followed close on the heels of Phobos 1, which was launched a few days earlier but eventually lost power and did not reach Mars. Phobos 2, however, reached the Red Planet and operated in Martian orbit for several weeks. Phobos 2 operated nominally throughout its cruise and Mars orbital insertion phases, gathering data on the Sun, interplanetary medium, Mars, and Phobos. Shortly before the final phase of the mission, during which the spacecraft was to approach within 50 m of Phobos’ surface and release two landers, one a mobile `hopper’, the other a stationary platform, contact with Phobos 2 was lost. The mission ended when the spacecraft signal failed to be successfully reacquired on 27 March 1989. The cause of the failure was determined to be a malfunction of the on-board computer. The controversy surrounding the loss of Phobos 2 is that some UFO enthusiasts have conjectured that Phobos 2 did not simply fail, but was attacked by an alien spacecraft. I won’t provide links here, but if you search online you’re sure to find sites describing the incident — including images of what is supposed to be the attacking ship or the weapon itself. I’m not sure why the Phobos mission would warrant such interference when so many subsequent missions have succeeded without incident; maybe the aliens left the scene, or are just very selective in what space probes they choose to destroy. Ten years ago today — July 8, 2003 — the “Opportunity” rover launched from Cape Canaveral on a Delta II rocket. Following about a month behind the “Spirit” rover, launched on June 10th, and known officially as Mars Explorer Rover-B, Opportunity was bound for the Meridiani Planum on Mars. The rover landed on January 25, 2004, to begin what was supposed to be a 90-sol (90 Martian days, very nearly 90 Earth days) mission. Opportunity is still working today. 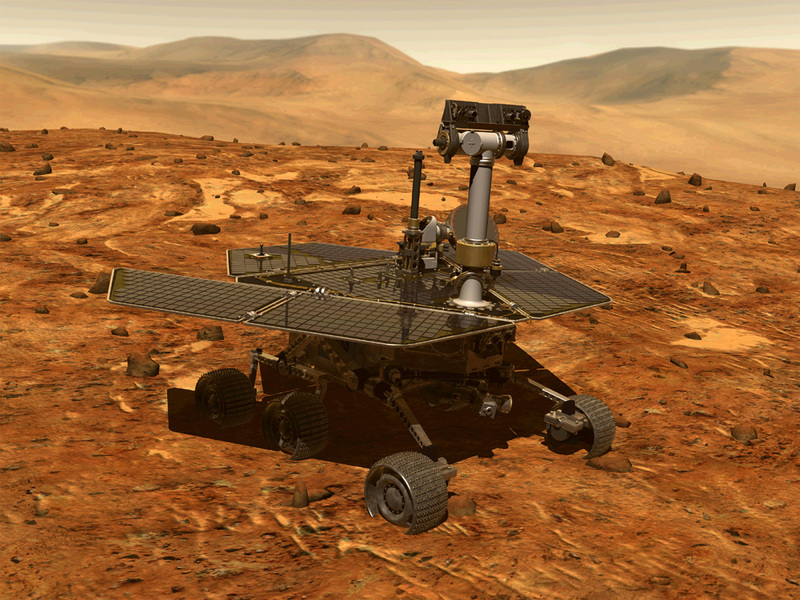 While contact with Spirit was lost in March 2010, Opportunity has continued to operate on the Martian surface: a tremendous tribute to the scientists and engineers who designed it, the technicians who built it, and the operators who direct it and keep its software updated. Long may it roll. Twenty-five years ago today — July 7, 1988 — the Soviet Union launched a Proton-K from the Baikonur Cosmodrome carrying the Phobos 1 spacecraft. Phobos 1, launched just a few days before its twin Phobos 2, was built to study the composition of its namesake Martian moon, and also to study the Martian atmosphere and surface by remote sensing from orbit. It also carried instruments to study the Sun and the interplanetary space environment. The spacecraft operated well until an attitude system failure — caused by faulty software — oriented Phobos 1 away from the Sun and prevented its solar arrays from recharging its batteries. The failure occurred sometime between August 30 and September 2, 1988,* and as a result Phobos 1 never reached Mars. *As of the posting date, the NSSDC page records this failure as happening in 1989; however, other sources (e.g., this page) give the date as 1988, when the spacecraft was on the way to Mars. Fifteen years ago today — July 3, 1998 — Japan launched an M-5 rocket from the Kagoshima Space Center carrying the Nozomi spacecraft on its way to the Red Planet. Nozomi (meaning “Hope”) was originally known as “Planet B,” and was Japan’s first space probe sent to orbit Mars. It carried instruments to study the Martian atmosphere, but unfortunately a propulsion system malfunction during its swing by Earth on December 20, 1998, ultimately prevented the spacecraft from entering orbit. remain in heliocentric orbit for an additional four years, including two Earth flybys in December 2002 and June 2003, and encounter Mars at a slower relative velocity in December 2003.
powerful solar flares damaged the spacecraft’s onboard communications and power systems. An electrical short was caused in a power cell used to control the attitude control heating system which allowed the hydrazine fuel to freeze. 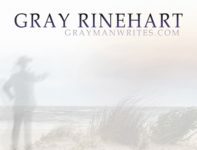 The fuel thawed out as the craft approached Earth and maneuvers to put the craft on the correct trajectory for its Earth flyby were successful. 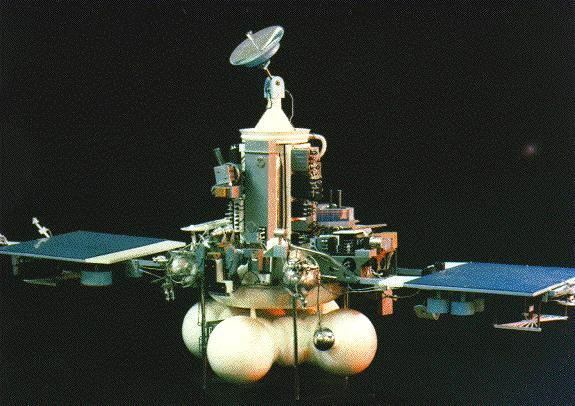 Operators guided Nozomi through the next Earth flyby in June 2003, but as the spacecraft approached Mars in December, it could not be put in the correct orientation to fire its main thruster for orbital insertion. As a result, Nozomi flew by Mars on December 14, 2003. 7) search for geological clues to the environmental conditions that existed when liquid water was present and assess whether those environments were conducive to life. The rovers landed successfully on Mars in January 2004. They originally were only supposed to operate for 90 Martian days (a little over 92 Earth days), but Spirit operated until March 2010 and Opportunity is still going. And on this date 40 years ago, the Radio Astronomy Explorer B — also known as Explorer 49 — launched from Cape Canaveral on a Delta rocket. 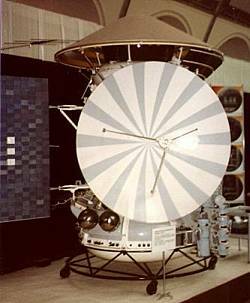 Its sister spacecraft, RAE-A (or Explorer 38), had been launched in July 1968. RAE-B conducted radio atronomy from an orbit around the Moon, and operated until 1977. *Noted primarily because I like Sea Launch, having gone on one of their launch campaigns. Fifteen years ago today — June 2, 1988 — the Space Shuttle Discovery launched from Kennedy Space Center on the final Shuttle/Mir mission. STS-91 astronauts Charles J. Precourt, Dominic L. Pudwill Gorie, Wendy B. Lawrence, Franklin R. Chang-Diaz, and Janet L. Kavandi, along with Russian cosmonaut Valery Victorovitch Ryumin, docked with the Mir space station on June 4th, marking the ninth time a shuttle had docked with the Russian station (but the first for Discovery). They transferred water and other supplies to the station, conducted a series of experiments, and returned astronaut Andrew Thomas to Earth after he spent 130 days on Mir. On this date 30 years ago, the Venera 15 radar mapping spacecraft launched from the Baikonur Cosmodrome on a Proton K rocket. Its sister ship, Venera 16, launched a few days later. Venera 15 entered orbit around Venus on October 10, 1983, and operated until July 1984. And 10 years ago today, the European Space Agency launched the Mars Express mission on a Soyuz-Fregat rocket out of Baikonur. The spacecraft arrived at Mars in December 2003 and released the “Beagle 2” lander, which unfortunately was lost. Mars Express itself continues to study the red planet from orbit. For anyone who cares, today’s space history post was delayed because the National Space Science Data Center’s catalog of spacecraft data has been balky lately.